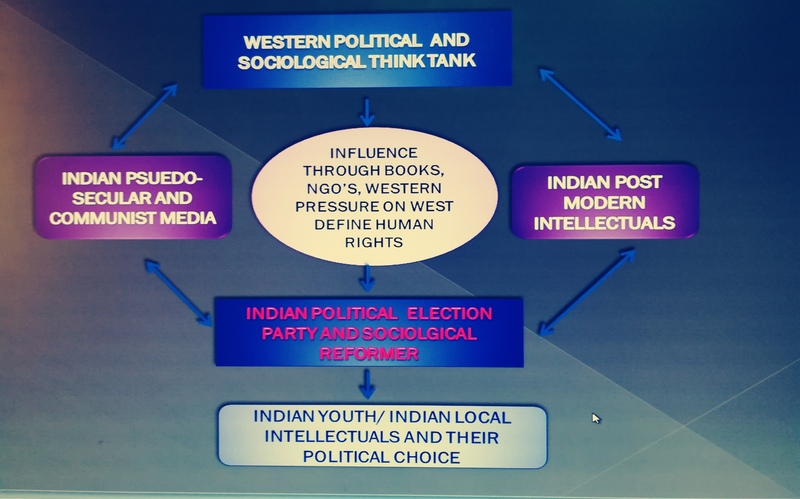 West is always equipped with something which we lack in India : An indigenous view of Society and Social reform. All the social reforms which we have done till date is simply an borrowed ideology from west. Let it be Marxism, Socialism, capitalism, feminism. Although many of such ideology has played very great role in reforming in our society. But still these borrowed Ideology has made us victim of inferiority complex with West. West also aware of this kind of bidirectional effect and use such effect for soft colonialism. WESTERN THINK TANK AND INDIAN MEDIA IN RELATION WITH WEST TRAINED INDIA POST MODERN INTELLECTUALS. Western think tank like Brooking Institute, Hoover institute, Pew research, Caldwell institute, Heritage Foundation are few of Think Tank who Sponcered and directly involves into spreading the social and political ideology all around the world. These thinks tanks offer see whole world with the lenses of western ideology of Monotheistic approach. They see all other civilization is inferior which need to be civilized by ideas produce by them. Few institute of them work tirelessly to have control (through specially Psuedo secular kind of govt) over govt, public policy and political choice ideologically. They have back and fourth knowledge translation with Indian media and individual intellectuals who keep low profile but have Highest impact on political system. Few of them is Sheldon Pollock, Wendy Doniger , Romia thapar, irfan Habib, Devi dutt patnaik etc These people control various prestigious Dept like History, social sciences , interpretations of hindu scripture etc. Control of the eminent intellectuals actually allow the ideological baised and any new ideas will be block if it’s against the nurrative of these knowledge watch keepers. Indian Post modern intellectuals see India through lenses of western experience and try to inject these values into society for digestion of Natural dharma with in a Indian people. Their Influence through Books, NGOs, literature festival, human rights defination actually crippled the very notion of Dharmicness of India because they always isloate any dharmic theory from their understanding of society. Example they dnt consider Dana as philanthropy because for them it’s an wages to brahmins in exchange of reciting mantras. While the real concepts of dand doesn’t include this notion. Their idea of sanyasha is an pessimistic approach while sanyasha in ancient India is method to exploring inner engineering through yoga and meditation for good to the society. At last we reach to an platform when all this dilute notion, ideology and knowledge system came to through media influence and trained intellectuals reach to the very local social reformers and political parties (who in power and even opposition). Political stance and reforms than created on based on such theory and ideology which is tasted for less reform but high divide. Example, Dalit movement and Dravidian movement has been constructed by Western indologist (read my breaking India series) in such way that various Jatis has been tagged as either oppressors or victim, while in reality they were all oppressed (less or more) by Invadors (Mugals and British). This Construct of divide run through various party (BSP, SP – Dalit party, Communist – liberal, AIMIM- Muslims party) and party ideology. Than again, Youth of India who is currently influence by Media and Parties is being constantly feed for anti dharmic notion, cast into right and left wing irrespective of seeing party potential and vision. This small blog is shown why our current youth is so divide politically because we have been feeded by West for choosing our vote based on poltical ideology which can trace back to influence of western think tank. Hope the current youth will see India beyond these divide create by these think tanks. Previous Breaking India Series: Use of Bible by Imperial forces of Europe to make slave Indians and Africans. Next William Jhon and Characterisation of Bible race science in Indian Social System.